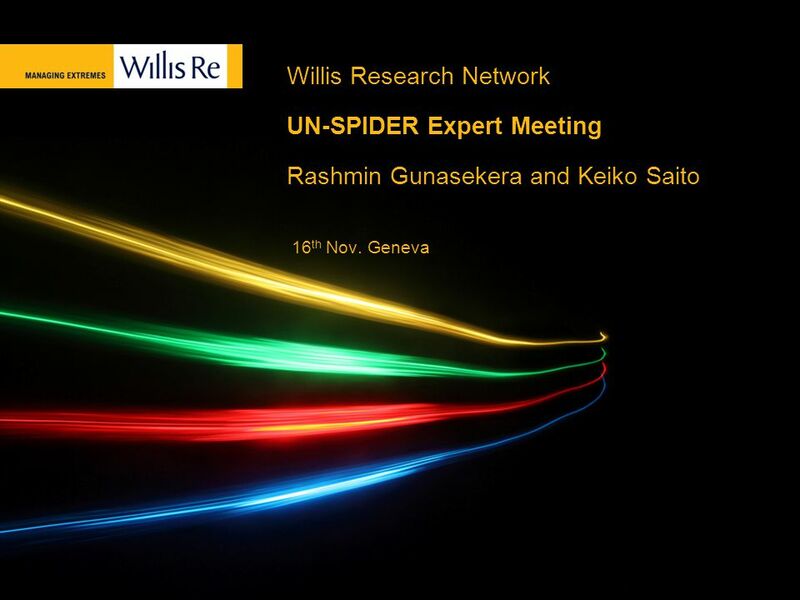 Willis Research Network UN-SPIDER Expert Meeting Rashmin Gunasekera and Keiko Saito 16 th Nov. Geneva. 4 4 Service: James Daniell et al. 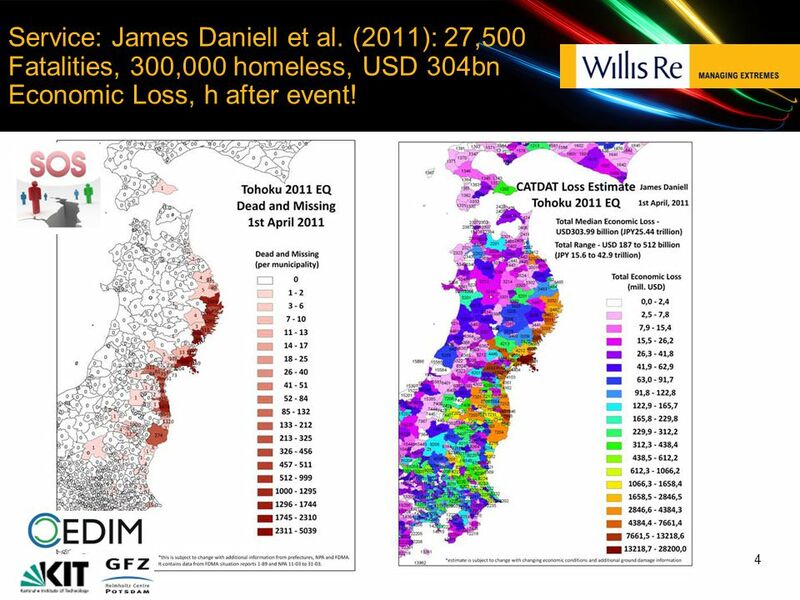 (2011): 27,500 Fatalities, 300,000 homeless, USD 304bn Economic Loss, h after event! 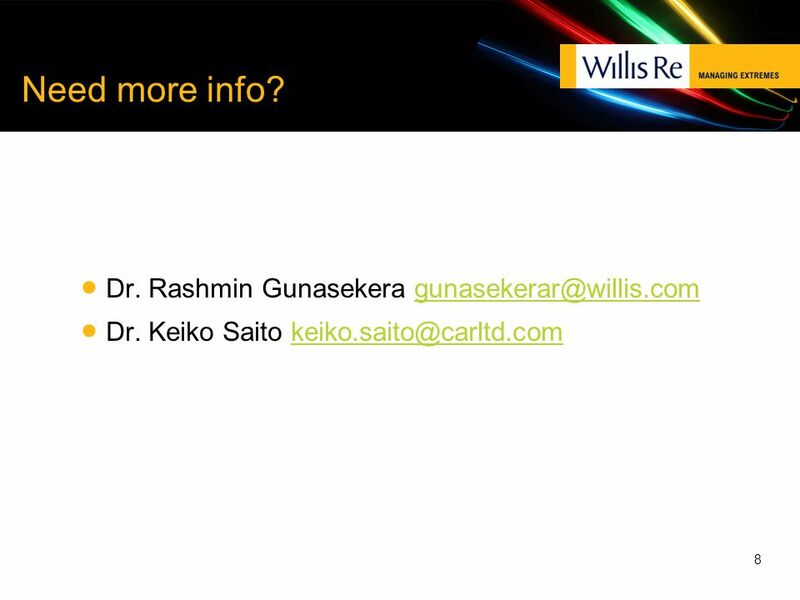 Download ppt "Willis Research Network UN-SPIDER Expert Meeting Rashmin Gunasekera and Keiko Saito 16 th Nov. Geneva." SOUTH EASTERN EUROPE DISASTER RISK MANAGEMENT INITIATIVE (SEEDRMI) European National Platforms and HFA Focal Points Strasbourg, 7 May 2007. A. M. Kaynia F. Nadim Earthquake-induced landslides Workshop UN-ISDR Pavia, 5-6 April 2011. CONSULTATION DAY EVENT - 20 May 2013 Scientific and Technical Platforms / Networks: Achievements and future goals CICG, Geneva Proposing the IRIDeS as. 17 June 2009 GP/DRR, Geneva UNCRD project School Earthquake Safety Initiative (SESI) in Asia and the Pacific Shoichi Ando Coordinator, Dr. 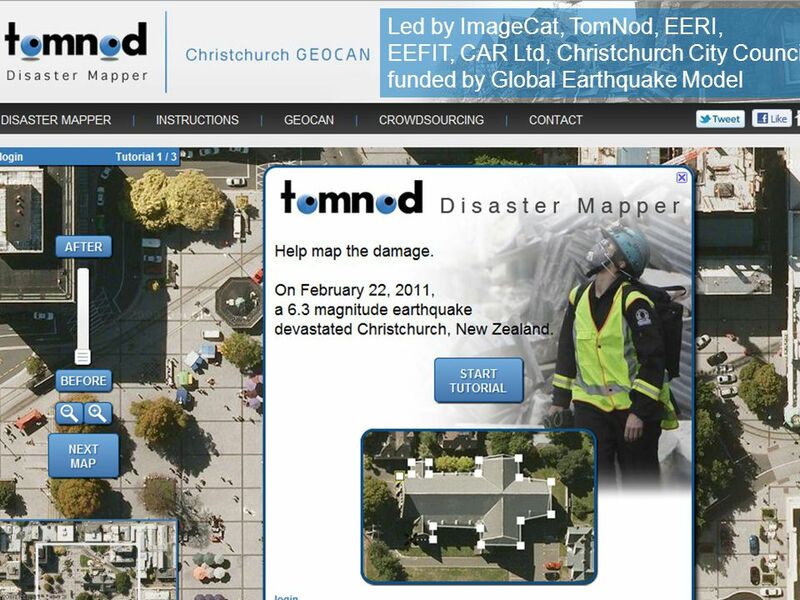 Disaster Management. UN International Strategy for Disaster Reduction UN International Strategy for Disaster Reduction 12 th Inter-Agency Task Force Meeting 12 th Inter-Agency. 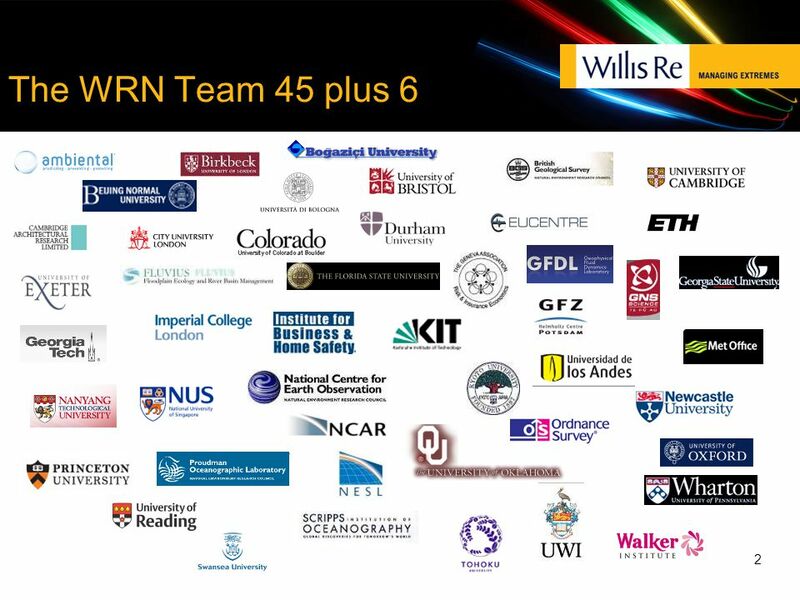 I nternational R ecovery P latform IRP(Hyogo) & ISDR Nov Development of a Cross- disaster K.M. Kit to Support Better Recovery ---Learning from Good. UN-HABITAT Inter-Agency Task Force on Disaster Reduction 8 th Meeting, Geneva, Nov Working Group # 3 Tools and Best Practices for Risk and Vulnerability. June 19, 2007Role of HAZUS-MH in Geospatial Preparedness The Role of HAZUS-MH in Geospatial Preparedness: A Perspective from the DHS Office of the Chief. ©Know Edge Ltd / RICS1 Robin McLaren Know Edge Ltd, Edinburgh Second UN-SPIDER Expert Meeting Geneva, 16 th November 2011 Report. 1 Comprehensive Disaster Risk Management Framework National Disaster Management Systems 1111 Introduction to Damage and Reconstruction Needs Assessment. 1 Amanda Dean Vice-President, Atlantic Insurance Bureau of Canada Sean Lee Manager, Engineering Services City of Fredericton Building Resilience to Natural. 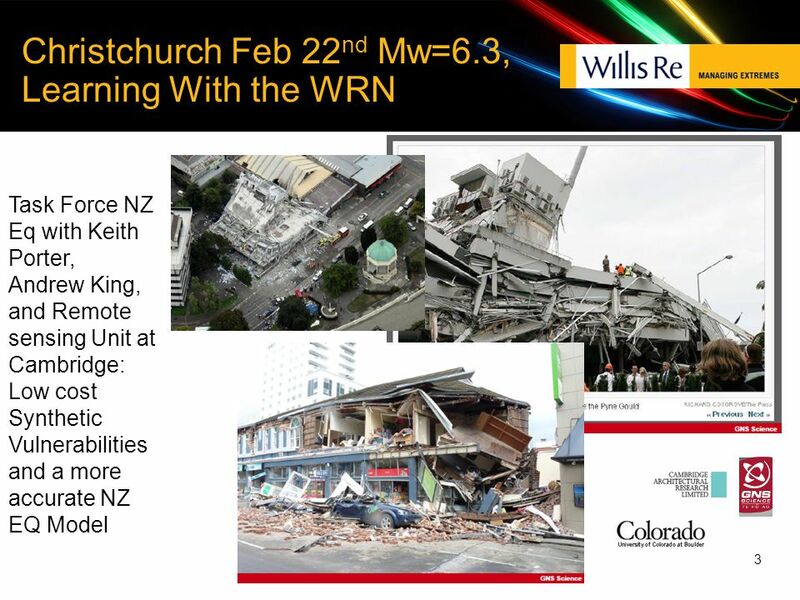 Tsunami Disaster Countermeasures Based on the Lessons Learned from the Great East Japan Earthquake March 16, 2015 Masahiko Isobe Vice President, Kochi. Naresh N Spatial Modelling Group RMS India Pvt. 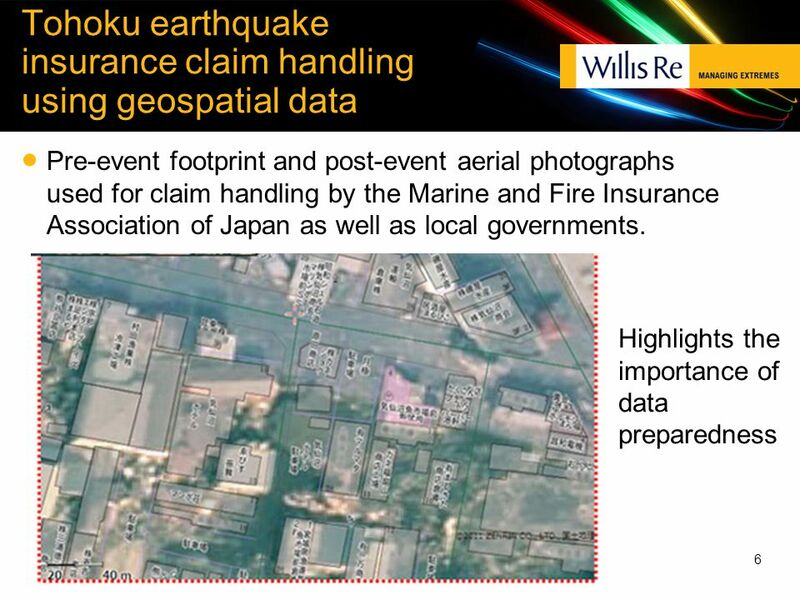 Ltd., Noida February 8, 2012 Damage loss estimation of the 2011 Japan tsunami: A case study Co-authors. 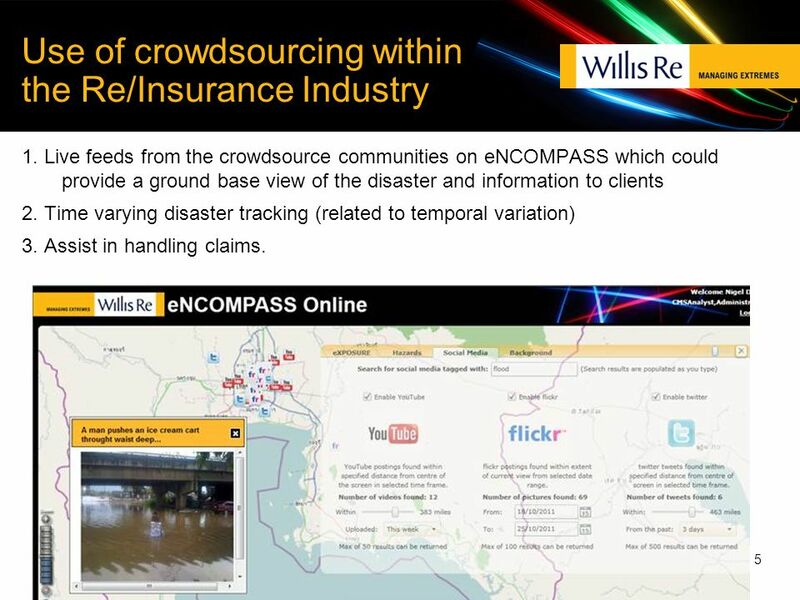 Natural catastrophe risk Quantification for insurance and reinsurance Andreas Schraft, Head Catastrophe Perils. Faults in Focus: Earthquake Science Accomplishments Thomas H. Jordan Director, Southern California Earthquake Cente r 28 February 2014. Financial Strategies for Managing the Economic Impacts of Natural Disasters1 11 The Economic Impacts of Natural Disasters on Developing Countries Session. Part One: Introduction and Federal GIS Response. 1 September 2007 Assisting NAPA implementation: focus on early warning systems UN International Strategy for Disaster Reduction (UN/ISDR) Silvia Llosa.